Paintball birthday parties in the Twin Cities are an original and exciting idea that everyone is sure to enjoy. Yes, all of the exciting types of games that can be played around the outrageously popular sport of paintball can also be modified to reflect a birthday party theme. In the sport of paintball, players strive to remove opponents from the game by means of tagging them with capsules shot from a paintball gun. The capsules contain non-toxic, water-soluble polymer that is completely biodegradable. It is a safe, exciting and fun way to interact with everyone present in a spirit of friendly competition. 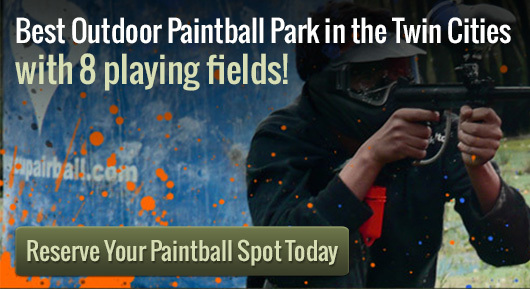 Anyone looking to hold birthday parties in the Twin Cities should look no further than Action Packed Paintball Games, which is the Minneapolis/Twin Cities region’s number one outdoor paintball park. Don’t worry about any of your birthday guests who may prefer not to join in the game, as they will be able to watch all the excitement from an observation area that makes watching just as much fun as playing. Our experienced and friendly staff members are experts at making everyone feel at ease, whether your guests are newbies or experienced players. The dining area with outdoor grills is the perfect place for before and after game celebration. Give your guests birthday parties they will never forget by letting Action Packed Paintball Games show you how to really celebrate the big day! For birthday parties in the Twin Cities contact Action Packed Paintball Games today, with dates available seven days a week from dawn to dusk by reservation. We work hard to provide the best outdoor paintball in MN. We can support private parties of over 100. We are capable of running exclusive paintball games 7 days a week, from sun-up until sun-down. Walk-on play is also available for smaller groups and individuals. Remember to call us at 952-492-6776 in case you have any questions or if you would like to book a time. Please get in touch with us as soon as possible, as advanced reservations are required.